More info reveals that the system is "full HD" (1920x1080) and uses simple SDHC/SD cards for recording...a medium that seems like such underkill for the price, but then again, SD cards are basically the most plentiful, cost-effective storage in existence. But in terms of nitty gritty details like codecs? We'll have to wait. 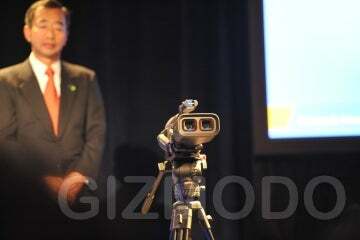 LAS VEGAS, Nev., Jan. 6 /PRNewswire-FirstCall/ — Panasonic Corporation (NYSE: PC) will release the world's first* professional, fully-integrated Full HD 3D camcorder in Fall 2010. The company will begin taking orders in April. Engineering samples of the professional Full HD 3D solid-state camcorder will be exhibited at the Panasonic booth (Las Vegas Convention Center, Main Hall, #9405) at the 2010 International CES in Las Vegas, USA, from January 7-10. Current 3D systems are large-scale setups in which two cameras are fitted to a rig in parallel, or vertically intersect across a half-mirror. Separate recorders are also required. In Panasonic's new Full HD 3D camcorder, the lenses, camera head, and a dual Memory Card recorder are integrated into a single, lightweight body. The camcorder also incorporates stereoscopic adjustment controls making it easier to use and operate.